These are supplied by Blackbird Bakery, local bakers who began on a market stall in East Dulwich and now have 6 shops across south London. They use the basics: butter never margarine, organic flour, free range eggs and fair trade sugar and respect the tradition and technique of making delicious breads and pastries from scratch without artificial flavours, preservatives or so called ‘improvers’. Our rye loaves are made by our award-winning local Bread Angel Gaye Whitwam of Sticky Mitts Kitchen. Bread Angels is a network of people up and down the country who run their own micro-bakeries. They aim to provide access to good bread within their communities either by selling their bread or teaching others to make their own. Her freshly baked bread is made by hand with the best quality ingredients. Made without added enzymes, enhancers or improvers, it is slowly fermented for maximum flavour, nutrition and digestibility. If you cannot tolerate commercial bread, it could just be modern production techniques and a host of additives that are creating the problem. Our real additive-free bread, made in the traditional manner, could be the answer for you. Gaye’s bread is dairy free and suitable for vegans. However, it is not made in an allergen-free kitchen. Other products are made in the kitchen which may contain traces of gluten, celery, cereals, nuts, eggs, fish, lupin, milk, mustard, peanuts, sesame seeds, soya and sulphur. Gaye supplies various types of bread to local customers. What goes into it? Flour – From Stoates Flour in Dorset. They mill a range of organic flour of exceptional quality. It is all stoneground to preserve the nutrients within the grain. 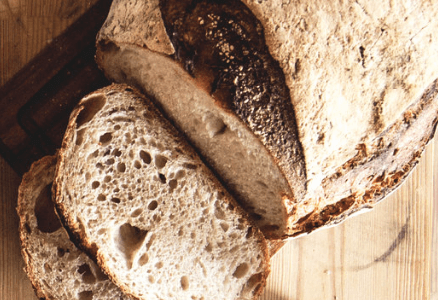 Yeast – From Doves Farm in Hungerford. Their Original Dried Yeast was specially developed for artisan bread making. This is not the same as instant/fast-action yeast which contains additives. 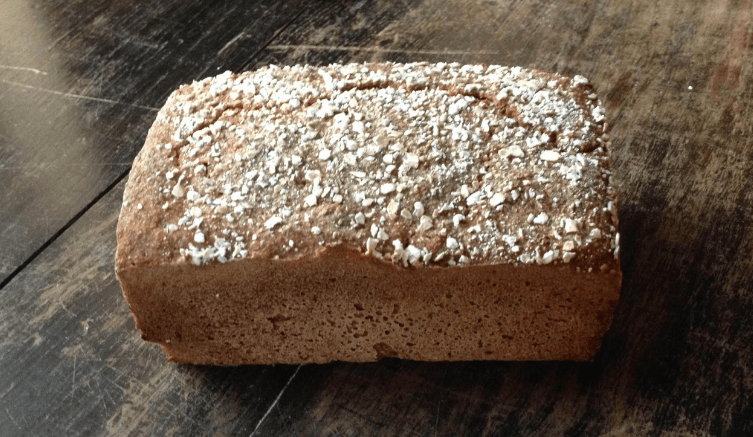 Natural yeast (for sourdough bread only) – From the Sticky Mitts Kitchen. Their own culture which replaces commercial yeast. This was the way all bread was made before it was learned how to make yeast into something that could be held in the hand! Sea salt – From the Salt Company in Cheshire. Their SeaSun Salt is naturally harvested from the Red Sea. It is washed in pure water and left to dry naturally in the sun. It contains trace elements but no iodine or anti-caking agents. Rapeseed oil – From Priors Byne Farm in the Weald of Sussex. The whole process of growing, cold pressing and bottling their Sussex Gold Extra Virgin Rapeseed Oil is carried out on the farm. A by-product of the pressing process is pellets which they feed to their own cattle. Rapeseed oil offers more health benefits than olive oil. It contains Omega-3, 6 and 9 and is a source of natural vitamin E.
Seeds – From Munchy Seeds in Suffolk. The Gingerbread Girl 7-Seed Mix is a special blend for Bread Angels. A mix of sunflower seeds, pumpkin seeds, hulled hemp, sesame, poppy, linseed and flax. Where possible they source UK-grown seeds but, due to climate restrictions, also source further afield. These are raw seeds which means they have not been roasted or pasteurised, unlike many other seed blends. This is an incredibly healthy mix of seeds providing Omega-3, 6 and 9, essential fatty acids, zinc and Vitamin E.
Molasses – From Meridian Foods in Hampshire. This by-product of sugar cane production is famed for its health-giving properties. Gram for gram, molasses contains six times as much calcium as cow’s milk and twice as much iron as liver. It is also rich in a host of trace elements, amongst which is chromium – said to be deficient in 90 per cent of Western diets. Barley Malt Extract – From Meridian Foods in Hampshire. This by-product of the barley malting process has a lower GI index than sugar. It is a complex mix of carbohydrates, trace elements and vitamins often lacking in processed foods.